Valentine’s Day may be hours away, but February 14th shouldn’t be the only time of year you focus on romance. As a full-time working woman and graduate student to boot, I know how hard it can be to find the time to spend with that special someone. Fortunately for couples everywhere, San Diego is full of luxurious hotels perfect for a romantic weekend escape. And with majestic views, gorgeous Craftsman-style architecture and one of San Diego’s best restaurants, The Lodge at Torrey Pines is an ideal destination a blissful San Diego getaway, no holiday or special occasion required. Pulling up to the Lodge’s grand yet secluded entrance, dark wood, glowing stained glass windows and the scent of fresh flowers greet you as you step into the lobby. As you head towards your room, the demure hallways feel cozy, despite the Lodge’s vast size. 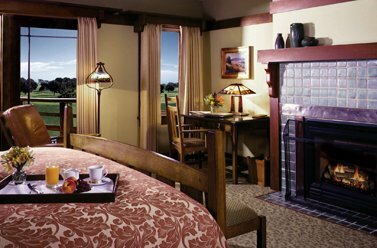 The Lodge offers a variety of guest room types that set the mood for romance and relaxation. On a recent weekend, my husband and I settled into a spacious Palisades Suite, complete with a fireplace at the foot of the bed and a balcony looking out onto the resort’s meticulously manicured lawn. As the sun began to set over the world-famous Torrey Pines golf course, we toasted with champagne and a plate of fresh fruit. 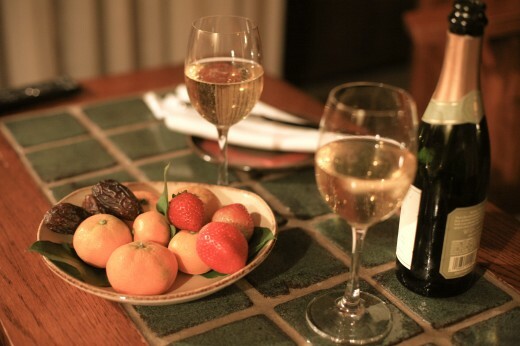 A fruit plate from the hotel was the perfect pairing with a bottle of champagne. There’s no shortage of ways to unwind at the Lodge. The Lodge offers a range of pleasant pastimes if all the relaxing gets to be too much. In the library, you can settle in with one of the available books or enjoy a game of pool or darts. On the lawn, colorful croquet sets dot the thick green grass. Oh, and I’ve heard golf may be a popular activity here…but I chose to spend an afternoon at the spa. The pristine white marble of the Spa at Torrey Pines had me wallowing in the lap of luxury before my massage even began. When it comes to a romantic dinner, few restaurants can top the Lodge’s signature restaurant, A.R. Valentien. Buttery sea scallops and a generous portion of tender New York strip steak were proof enough that Chef Jeff Jackson is one of San Diego’s best, and their friendly sommelier will help even the most novice wine drinker find the perfect pairing. While a bottle of Silver Oak may accompany a birthday or anniversary meal, it’s also nice to be able to indulge in a mini-splurge with their extensive by-the-glass selection of top-notch wines. Chocolate and slippers greet you at bedtime. Returning to our room, friendly touches from the turn down service made our stay feel even more special. A delicate chocolate bar emblazoned with the resort’s logo rested on our pillows, while bedside mats held cozy slippers waiting to warm our feet before bed. 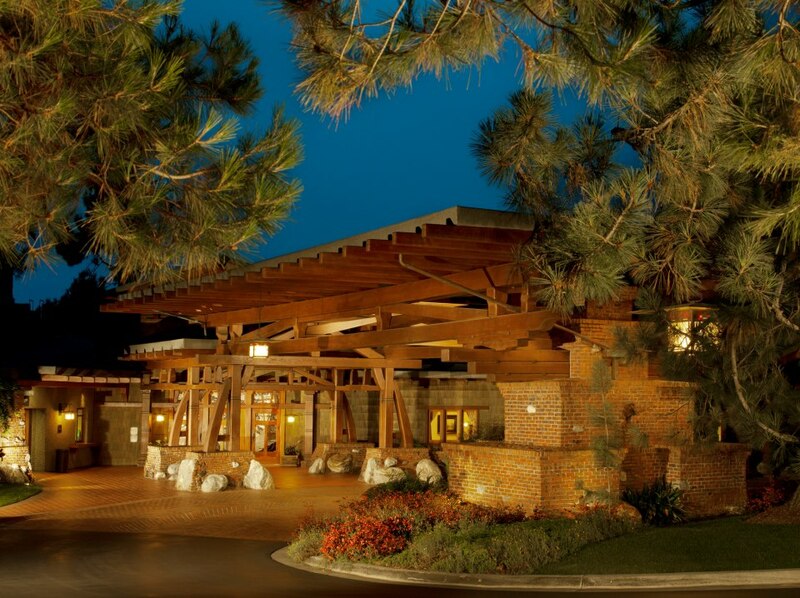 Combined with the beauty of the property and the exceptional food, the attentive and thoughtful service at the Lodge at Torrey Pines make it a can’t-miss hotel for relaxing and reconnecting. You can’t ask for a better view! This entry was posted in Culinary, Hotels & Places to Stay, Insider Tips and tagged couple, la jolla, relaxing, romance, romantic, the lodge at torrey pines, torry pines, valentine's day by Candice. Bookmark the permalink. The Lodge at Torrey Pines is beautiful, and the people are wonderful. As a travel agent, I had the privilege of doing a site inspection a few months ago, and was thoroughly impressed. 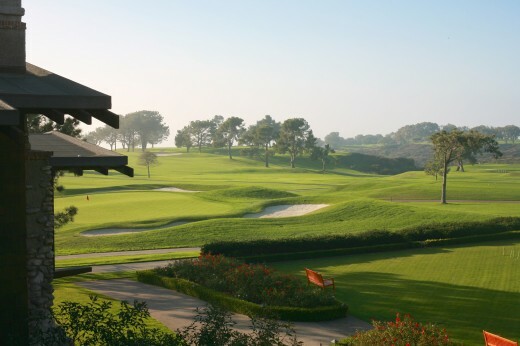 When I have clients who are golfers but also want the beach and want to stay in the San Diego area, I book them here!